Teena Borek was born in the Canadian maritime province of Newfoundland. She came to South Florida in the 1970s, where she met Steven Borek, a Homestead vegetable farmer. The couple married and had two sons, Steven and Michael. After Steven’s untimely death at the age of 24, Teena ran the 500 acre vegetable farm knowing very little about farming or farm management. Instead of selling the farm, she continued farming so that her sons could follow in their father’s footsteps. For the last forty years, Teena has been an active member of the Dade County farming community. At one time, she was the only female row-crop farmer. Teena is a graduate of the Wedgworth Leadership Institute for Agriculture and Natural Resources. She is a charter member of the Florida Ag Promotional Campaign and a past President of the Dade County Farm Bureau. She serves on the board of directors of the Florida Tomato Committee, Florida Fruit & Vegetable Association, Community Bank of Florida and Everglades Community Association. 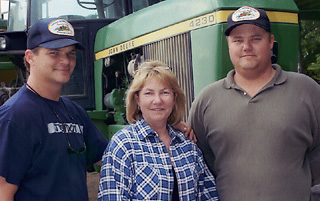 Teena was chosen as "Agriculturist of the Year" in Homestead in both 1985 and 2011. She was named 2004 Woman of the Year in Agriculture by Agriculture Commissioner Charles Bronson and the Florida Department of Agriculture. Miami-Dade County and the cities of Homestead and Florida City have proclaimed "Teena Borek Day" in her honor. Through her association with organizations such as Les Dames d’Escoffier, Slow Food and Save American Family Farms from Extinction (SAFFFE), Teena continues to educate the public on the importance of preserving our family farms by buying local produce and knowing where your food comes from. In 2011, she started TeenasPrideCSA program to supply local family farms fresh healthy produce to families in Dade and Monroe counties. Michael, a third generation grower and owner of Michael Borek Farms, is one of a handful of young individuals who chose to return to the family farm after college. He currently grows field vine-ripe tomatoes and greenhouse heirloom tomatoes. He practices best management practices in every aspect of growing quality produce and maintains a food safety certified farm and packing facility . An active member of the farming community, he has traveled to Tallahassee and Washington, DC to educate legislators on the importance of agriculture to Florida’s economy. Michael Borek, has succeeded in his goal to provide his local fresh produce to Miami Dade families and is a major supplier of heirloom tomatoes to many upscale Miami Dade restaurants and stores. Michael is transitioning from field-grown to greenhouse-grown heirloom tomatoes, cluster tomatoes, yellow tomatoes and bell peppers. He believes the farm will be a major producer of other sustainable specialty crops in the near future. He continues to look at new technology to reduce fertilizer and pesticide inputs. Michael graduated from Webber International University with a degree in business and a minor in marketing. He is a past director of the Dade County Farm Bureau and the Dade County AGRI council. 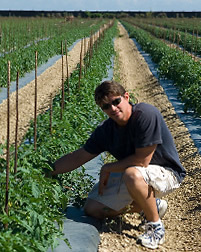 He is currently a director of the Florida Tomato Committee and the Homestead Pole Bean Co-Op. 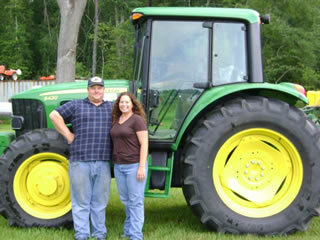 Steven Borek, Jr. and his wife, Amanda have a farm in Gilchrist County, Florida. With over twenty years of experience growing everything from snap beans to okra to sweet corn in Homestead, Steven lives in High Springs where he and Amanda grow sweet corn and snap beans for the summer market. In winter they grow sweet corn in the Redland farming area of Dade County. Steven is a past director of the Homestead Pole Bean Cooperative. Steven graduated from Robert Morgan Technical College as a diesel mechanic. He is also a commercial helicopter pilot. Amanda graduated from University of Florida with a Bachelor's Degree in Agriculture Operations Management and a minor in Soil and Water Science. They have one son, Karl Oliver. 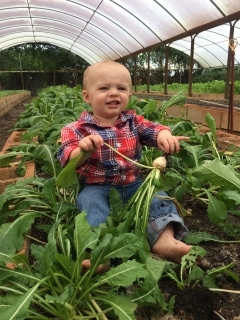 He is the first of the fourth generation of Borek Family Farm.